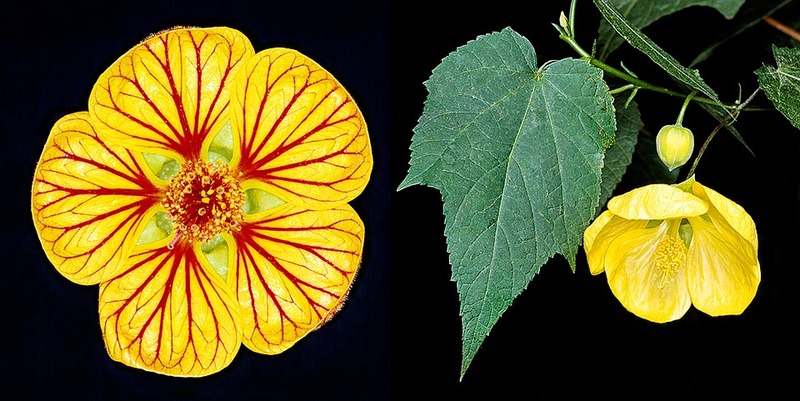 The genus Abutilon includes about 150 species distributed in various tropical and subtropical areas; under the name Abutilon × hybridum hort. ex Voss. (1894) is classified a complex group of hybrids, obtained in Europe since from 1800, between various species of South American origin, mainly A. darwinii, A. pictum and A. striatum, with foliage which recalls, for its shape, that of the maple (from which come several common names). The name of the genus comes from the Arabic name “aubūtīlūn”, given by the great Persian philosopher and physician Abu ‘Ali al-Husayn ibn Sina (980-1037), known in the western world with the name of Avicenna, to a species belonging to the family of the Malvaceae. 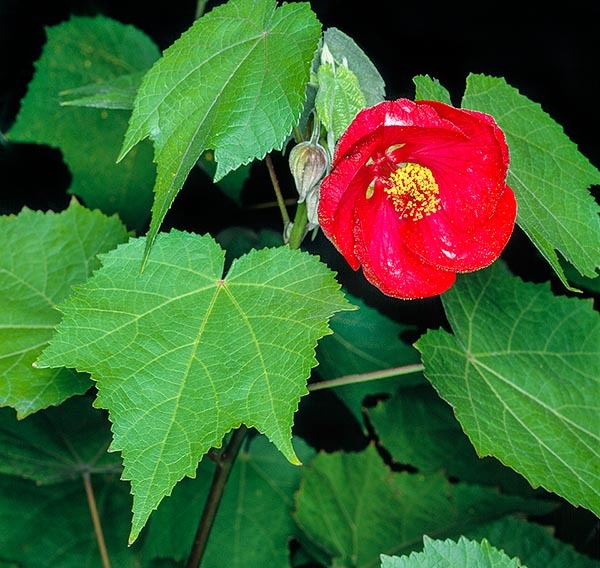 It is commonly known as: “Indian mallow”, “flowering maple”, “parlour maple”, “weeping maple”, “Chinese lantern”, “Chinese bellflower” (English); “Samtapfel”, “Abutilon weiss”, “Schönmalve”, “Zimmerahorn” (German); “lanterna japonesa”, “lanterninha japonesa” (Portuguese); “érable d’appartement” (French); “farolito japonés”, “candilitos chinos”, “linterna china” (Spanish). It is a matter of evergreen shrubs which can surpass the three metres of height, if cultivated in the open ground where the climate allows so, but usually kept lower and compact with convenient pruning; the leaves, with an ovate to lobed form, are of a pale green colour, but there are also white and yellow variegated varieties. The flowers, hermaphrodite, pendulous, bell-shaped, of a diameter of about 7-8 cm, are of white, yellow, orange and red colour, depending on the variety, and are produced during the whole vegetative season. It reproduces by seed, which germinates in 2-3 weeks, and by semi-woody cutting in summer, and woody in winter. These hybrids can be cultivated in the tropical to the warm temperate climates, in well drained soils, but kept humid, preferably in slightly shaded position; elsewhere, they can be cultivated in pot, also for indoor decoration, or as annuals in the open ground, in such case they reach a height of around one metre in one single vegetative season. → To appreciate the biodiversity within the MALVACEAE family please click here.